In recent years there has been a significant growth in the number of people wanting to visit the battlefield sites of the Western Front in Belgium and France. This increased interest stems from discoveries made in family history research and the desire to follow in the footsteps of a WW1 ancestor, students studying the First World War in the school curriculum, best-selling novels introducing the subject to a wider audience, and a range of popular plays, films and television documentaries on the subject. In response to the increased interest the variety of facilities available for visitors has also grown. Tours to the First World War battlefields, whether you choose to travel independently, with a guide or with a group, are carried out by hundreds of visitors each year. The information below is offered to help you plan a tour and is given in good faith. Listening to a guide explaining the British attack on Mametz Wood on 7 July 1916 at the 38th (Welsh) Division dragon memorial. There is a wide choice for battlefield tour travellers these days, with numerous companies offering a variety of tours with regard to the number of days of the tour, the size of the tour vehicle - minibus or coach - and the subjects or places to be covered on the tour. Some tours start from the United Kingdom as an inclusive package tour, others can be joined once you are in the battlefield area. 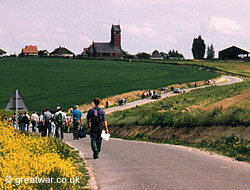 A list of the main battlefield tour operators is provided on this website. As far as we know these companies comply with all tour operator and insurance regulations for taking travellers to the Belgian and French battlefield sites. When making enquiries with them, you are strongly advised to discuss any special requirements you may have such as a visit to a particular cemetery, memorial or place of interest in advance of joining a tour. Also, ask for travellers' testimonials to get a feel for how their travellers have found previous tours. You may like to know, too, if their company and/or their guides have any affiliation or accreditation with an organization such as The International Guild of Battlefield Guides, The Western Front Association or Blue Badge Guides. greatwar.co.uk is proud to be a Supporter of the International Guild of Battlefield Guides. 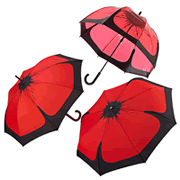 The aim of the Guild is to raise the understanding and promote best practice for guiding on the battlefields. 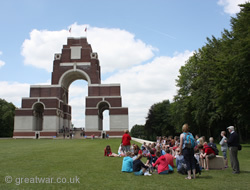 A school group at Thiepval Memorial on the Somme battlefields. There are a number of battlefield tour companies which specialize in tours for students. It is the responsibility of the group organizer to ensure that these companies are legally covered, bonded and compliant with all the appropriate regulations for taking groups and young people. Visiting St. Charles de Potijze French Cemetery, Ypres Salient. Even if the battlefield you wish to visit is near a town, it is likely that the sites of the battles, the memorials and cemeteries will be located in a rural landscape. The distance between each place of interest may be up to several miles and, therefore, getting around can be difficult and it is recommended to travel around the battlefields by car. Having said that, once in the battlefield area, many people choose to walk and cycle around the battle sites, taking the opportunity to spend time reflecting on the what happened there almost a hundred years ago and enjoying the now peaceful countryside. For enquiries relating to car or bicycle hire, bus and train timetables contact the Tourist Office in the area you plan to visit. Some of the hotels, Bed & Breakfast and self-catering accommodation offer bicycles for hire. With regard to the types of location to be visited on the battlefields, the easiest way to travel between the memorials, museums, cemeteries and battlefield sites is to travel by car. 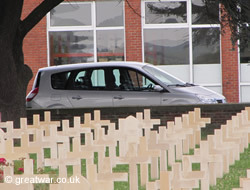 If you travel to Belgium or France by rail or air, it is advisable to hire a car for the battlefield visits if possible. On the more frequently visited battlefields, such as the Ypres Salient and the Somme, there are maps available from the local Tourist Offices for cycling routes. 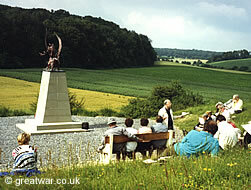 Some organized battlefield tours also offer guided battlefield walks or cycling tours. Some of the hotels, Bed & Breakfast or self-catering accommodation will provide bicyles free or for hire plus information about local cycling routes. A guided walking tour on the Somme battlefields, walking through No-Mans-Land of 1 July 1916 towards the German Front Line near Thiepval church. Have a look at the following websites for planning a route across the English Channel by sea or tunnel. Travel by rail can be made by the Eurostar service from the United Kingdom or within France and Belgium to Lille Europe Station, Brussels or Paris. Local train services offer onward travel. Travel by air can be made to Brussels (Bruxelles) in Belgium, Paris, Lille, and the recently opened Albert-Picardie airport in France. As the battlefield locations are generally in rural areas, it may be that travel by public transport is often not available or is available but with an infrequent service. If you arrive in the battlefield region independently and using public transport, it is recommended that you contact the local Tourist Office or the accommodation where you are staying to ask for information on the best way to make your way around the battlefield area you are wishing to visit. 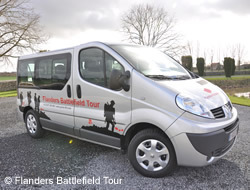 Flanders Battlefield Tour, a battlefield tour operator based on the Western Front battlefields of Belgium and France. Once you have arrived in the battlefield area, you may wish to take a guided tour as an introduction to the area, or make a pre-arranged tour visiting places of special interest to yourself. There are a number of independent guides and organized tours available to travellers who make their own way to the battlefields and want to join a guide or a tour once there. Tours can be for a half day or a full day introductory visit, your guest-house host may offer a tour during your stay with them, or you may join a tour guide offering tours to locations visiting sites following a particular theme. Tourist Offices should have a list of recommended guides and in some cases will be able to arrange contact with the individual or tour organizer on your behalf. Location and details for Tourist offices are provided in our battlefield information by area. Our list of battlefield tour operators states which operators and guides are based in Belgium or France. By arrangement some of these guides will collect you from your accommodation or the railway station on your arrival. There are a number of Apps available to assist visitors to the battlefields. 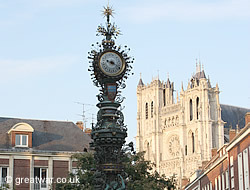 The beautiful clock with the cathedral in the background in the centre of Amiens. We offer lists for suggested accommodation to suit all budgets in the most visited areas: hotel, self-catering, Bed & Breakfast, hostels and camping sites. We also provide links to tourist offices and websites to ask for further advice on travel and where to stay. Artillery shells at the side of a field awaiting collection by the authorities for safe disposal. Visitors to the battlefields should be aware that even over 90 years since the end of the First World War there are still dangers posed by unexploded ammunition. DO NOT TOUCH or pick anything up if you are not sure what it is or if it looks like a piece of ammunition. Every year several thousand artillery shells of all sizes are found in the ground by farmers, construction workers and builders. 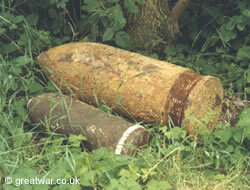 This is often called “The Iron Harvest”. Particularly in the ploughing seasons in rural areas shells can often be seen placed at the side of a field by a farmer for safe collection by the authorities. Exploring the battlefields off the beaten track will be a rewarding experience, especially if you are carrying out research in the footsteps of a relative. Visitors are reminded to ask permission if you want to go onto private land. Be mindful of your own safety if exploring any battlefield remains such as bunkers or tunnels which are not designated public sites. 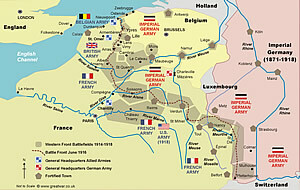 Our map showing locations of the Western Front battlefield areas. Suggested guidebooks for visiting the Western Front.